Every Thursday afternoon (except on Superbowl Sunday), a group of very nice folks gathers together behind a local neighborhood pub, fire up a Weber™ grill, bring out their contributions, usually sausages, marinated meats, shrimp and other delights for the fire. I bring Jalapeño-cheese sourdough bread (and sometimes smoked-pepper sourdough). If I don’t show up for a week or two, when I return, there are comments about how much they missed the bread. Not me, just the bread. This recipe was developed especially for this group. It has been tested and adjusted over some months, with the goal of perfection, my partners in social libation being the arbiters. Some months ago, they declared I should stop fiddling with the recipe, it didn’t need any more adjustments. They were dead serious. This could be considered a compliment. Once I ran short of bread flour and used all-purpose. They noticed. This bread was developed for toasting on the grill. Untoasted it tastes awful. Trust me on this. Do not allow anyone to taste it untoasted lest they think your marbles have wandered off without you. Some folks have gently urged me to share this recipe. I have been reluctant, not because of a desire for exclusive notoriety but because of the amount of effort to make it. Since I bake (and dehydrate) on a regular basis, it’s not such a big deal for me. This is not stir and heat cooking. But here it is, judge for yourself. Buy a gallon of nacho-sliced jalapeños. Buy a coupla pounds of cheese. Re-hydrate jalapeños and cheese with sherry. Add re-hydrated jalapeños and cheese. Knead and finish the bread. For the bread making I refer you to Larry’s Sourdough Bread Method for the way I make sourdough bread. However this recipe would probably work with a regular bread recipe. Let us know. I use L’Equip dehydrators. Although they come with six trays, L’Equip claims that up to twenty can be used. Wanting additional trays, but at over $25 a pair, I found a seller with open box and got an entire second dehydrator for $85. I have only used the L’Equip dehydrators, so I cannot compare them with any others. I also dehydrate onions for sourdough bread, which is more popular than my regular sourdough. For more on the onions and dehydrating, see How To Make Dehydrated Onions. 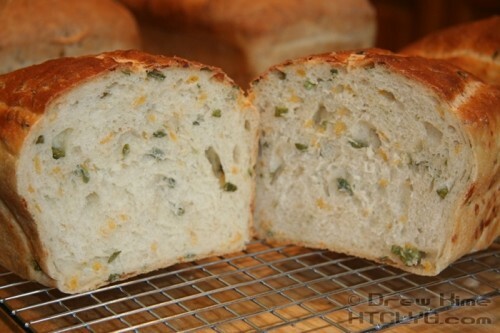 For onion bread and pepper bread see Onion and Pepper Variations on Larry’s Sourdough. O.K., enough promotion.